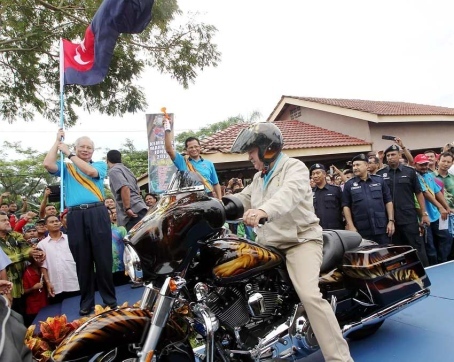 KULAIJAYA: Prime Minister Datuk Seri Najib Tun Razak today praised the "Kembara Mahkota Johor", saying the unique annual royal motorcycle tour programme has endeared the Sultan of Johor, Sultan Ibrahim Ibni Almarhum Sultan Iskandar Sultan, to the people of all levels in the state. "Kembara Mahkota Johor is a programme unique to Johor. 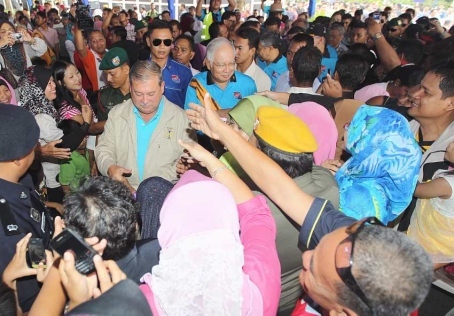 It reflects the concern of the Sultan of Johor for his people," he said at the launch of the programme at TJ Mart, Saleng, here. The four-day programme beginning today will see a motorcycle convoy led by the sultan and the Tunku Mahkota of Johor, Tunku Ismail Idris, crisscross the state covering a total distance of 1,012 kilometres. Najib, who arrived in Johor Baru yesterday evening, flagged off the Kembara Mahkota Johor 2012, watched by thousands of people. Also present at the flag-off were Johor Menteri Besar Datuk Abdul Ghani Othman, state executive councillors, senior government officers and Johor Barisan Nasional (BN) leaders. Najib said Kembara Mahkota Johor provided the sultan with the opportunity to find out how the people fared in every corner of the state. "I believe no development (concerning the people) escapes the sultan's observation," he said, adding that the programme was in line with the 1Malaysia philosophy of "People First, Performance Now". Najib said the people of Johor were blessed to have a sultan who is close to them. 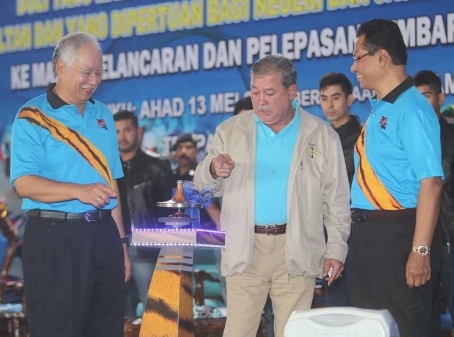 The prime minister also said that he was most honoured by the sultan's invitation to him to flag-off the participants of Kembara Mahkota Johor 2012. The prime minister said in jest that he was not skilled in handling big bikes and had therefore instructed two of his Cabinet ministers to accompany the sultan in the convoy. Home Minister Datuk Seri Hishammuddin Tun Hussein and Defence Minister Datuk Seri Ahmad Zahid Hamidi are taking part in the programme. Meanwhile, Najib said, Johor was on the threshold of a major change by way of various development and transformation programmes implemented by the government helmed by the BN. He said Johor would continue to savour excellence under the existing BN state government. It was most important for the people of Johor to retain the existing state government, similar to the federal government, to facilitate smooth implementation of development, he said. "With similar governments (at the federal and state levels), Johor will enjoy greater excellence," he added.